There’s been a plethora of new babies born to my friends recently and it’s making me reflect upon my own experience of becoming a mum – in particular, how my faith has grown. The last five years of my life have been the most exciting ones faith-wise, yet this isn’t because I’ve been extra holy – in fact, the number of times I’ve sat down with my Bible for a traditional ‘quiet time’ is shockingly small. I’ve missed a lot of sermons due to being on the kids’ work rota or chasing toddlers round the church or placating an unsettled baby. On paper, my spiritual disciplines would look pretty awful to an outsider. So what’s helped? * My tribe. I’ve been so blessed by the good Christian friends God has put in my way since, and because of, having kids. We don’t force theology, it just comes naturally. It comes when we’re chatting over tea and cake; we grapple with a tricky Biblical application over jigsaws with our kids; while we’re eating a plastic banquet, prepared by the littlies, we’re also musing over Scripture and faith and life and the grey areas. It’s not a big deal – and it comes alongside tales of the previous night’s sleeplessness, potty training anecdotes, plans for spa days and what so-and-so posted on Facebook – but it’s these snatches of God-conversation with friends which have shaped me, encouraged me, and got me thinking over the last few years. I couldn’t be more grateful for the ‘tribe’ God has put in my life. If you’re new to this parenting business, pray for your tribe to come. And if it’s already flippin’ obvious who they are: use them! Hang out more, open up to them, share your burdens and your thoughts, pray with them. * Blogs, books and articles. Gradually, I’ve been able to read more whole books – but in times when that’s been too much, I’ve really appreciated blogs and articles sent my way by friends or posted on Facebook. Punchy, succinct thoughts on an aspect of Christian living. Friends, if you read something good: share it! It could be just the encouragement one of your tribe needs. * Serving and ministering. This is a really tough one. It requires a fair bit of planning (and sometimes childcare) to be able to serve in your church or community when you have kids. It’s never easy – but it grows faith. If I haven’t picked up my Bible in a couple of weeks, you can be sure that having to plan a kids’ work session or story for Toddlers, or preparing a Bible study for a Mums’ cell group, or planning to mentor a younger Christian will force me to open it again! I’ve grown in faith as I’ve seen others grow in faith. 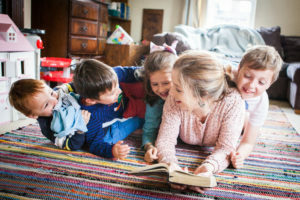 There have been other times when reading a children’s Bible or Christian storybook with them, or discussing faith, or praying, or playing through the Bible has kept me spiritually ‘topped up’ as well as them. * My husband. I approach this one sensitively, knowing that several friends long for their other halves to come to know Jesus. I am so massively grateful for a husband who is unswayed in his pursuit of loving Jesus more, and I don’t take this for granted. He shares with me the things he’s thinking about, the books he’s reading, the articles he’s found – and it’s like I benefit from the time he’s put in, without committing lots of energy that I don’t have. Of course Christian wives are just as responsible for encouraging and challenging their husbands with new theological thoughts – but at this stage in life, low on time and energy, I’m thankful for a husband who keeps me on my toes. If you’re a Christian whose spouse does the bulk of the childcare, how are you supporting them in their faith? Those of you who are courageously and unreservedly pursuing Jesus without encouragement from your partner: we want to walk this journey with you. Please tell us how we can be better Christian siblings to you. Before I had kids, my view of discipleship was very different. Perhaps I could liken it to a knitted square in one colour, row upon row of identical stitches forming a unified whole. There was one way to pursue God: through the Bible, in a daily quiet time, followed by a shopping list prayer. Nowadays, my walk is a tapestry: many different colours and stitches interacting in varied ways. There are dropped stitches too, as well as areas not yet stitched. I am an ongoing work, more aware of my imperfections than ever, but more aware of God’s grace than ever – grace which enables me to pursue discipleship in the haze of early parenthood, guilt-free and joyful. Yes I think that short blogs discussing areas of Christian Discipleship can be very encouraging at times of child-fueled hectic busyness – especially this blog! Having small children certainly does highlight our own imperfections. I have come to understand my need for God’s Grace since having kids, in a way that I never appreciated before that! Thanks Andy! Yes, becoming a parent certainly is like looking in a mirror for the first time isn’t it?! Suddenly we see all the ways that we are so far from God’s standards of holiness, and yet He loves us so much. Pure grace! I strive for as much patience and grace with my own kids on a daily basis…grr!